﻿An update to the classic JANES shoe - perfect for warmer weather - Open-Toe JANES! 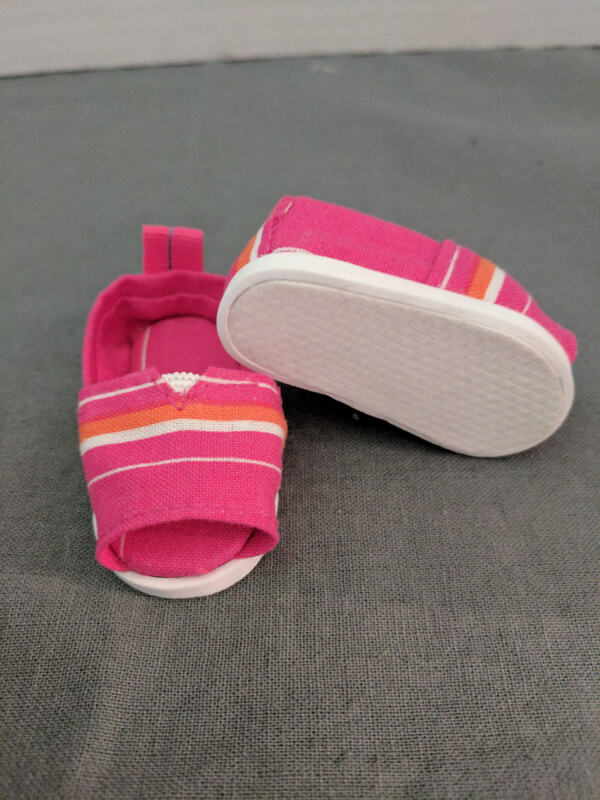 These shoes are designed to fit the 14.5 inch doll foot such as WellieWishers™. This PDF sewing pattern is designed to use woven cotton fabrics and works with stripes, florals, polka dots, thin corduroy and much more. 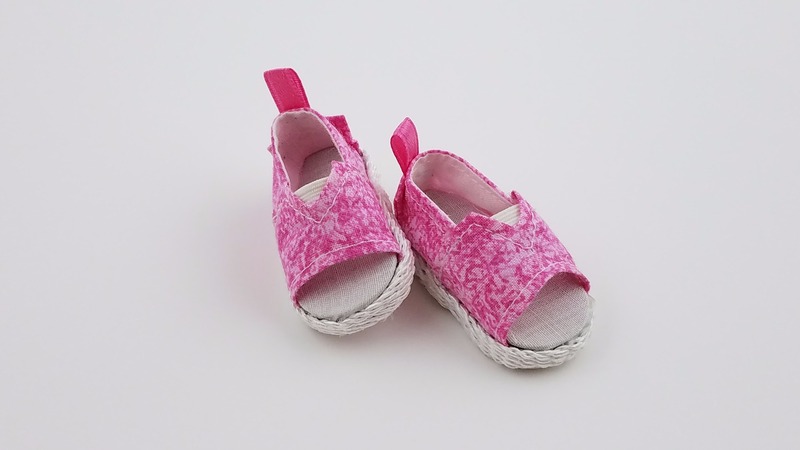 These darling little shoes are simple to sew and just take a bit of patience to construct, but once you've put your first pair together, you'll breeze right through the assembly for your next pair. Special Note: This is a new sole shape designed specifically for the shape and size of the WellieWishers™ doll foot. This shoe pattern will NOT fit other 13-14” dolls (like Les Cheries and H4H). Designed for use with SHAPE 3 Pre-cut soles in Black/White or Color Variety 2. 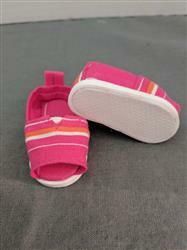 This darling shoe pattern is also available for 18" doll such as American Girl®. ﻿Recommended Fabrics: 100% Woven Cotton, Corduroy, and Linen. 1/4" Middy Braid or other flat braided trim is used to give them that authentic look! PixieFaire and the designers featured are not affiliated with Mattel® WellieWishers™. Due to their size found these a challenge to make when comparing them to shoes for 18" dolls. That stated; a) the next pair I will opt to eliminate the 'heel piece' and 'twill tape loop' as personally found it created too much bulk and b) again will opt for only one line of stitching across the top of the shoe itself. To conclude am pleased with the overall finish (not sure about the fit as I do not have my Grand Daughter's doll) but wish to add in lieu of l/4" Steam A Seam, I used l/4" Heat 'n Bond Quilter's Tape which worked out fine. Secondly, I textured the soles (see photo) by using 'copper' wire mesh window screening and the use of a hot iron. Method: Apply screen over foam and a layer of baking parchment paper over both to protect the face of your iron plate. Cut out your soles afterwards. *Note: Copper rapidly conducts heat and time will vary according to iron used and pressure applied. It was a great experience, the shoe went together nicely, Thanks so much! this is very tiny. it fits well but is smaller than shoes i have made for the wellie. Great directions. Went together quickly and looked cute on.